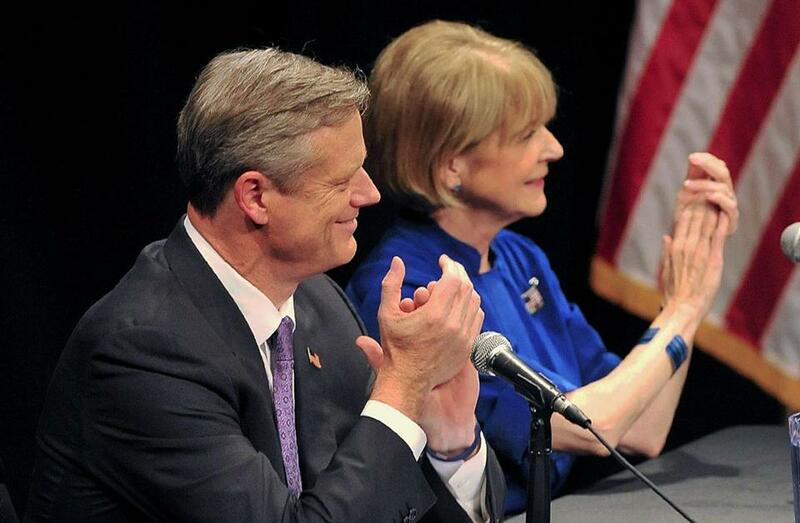 Republican Charlie Baker and Democrat Martha Coakley applauded at the start of a debate in Springfield, Mass. on Monday night. Sept. 29, 2014. Democrat Martha Coakley and Republican Charlie Baker sparred over early education Monday night in the first postprimary debate of the governor’s race. Baker said he supports “targeted investment” in early education, but noted that research shows that the benefits of preschool can fade over time. He said the state needs to improve education in elementary school and beyond to maintain any academic gains realized in preschool. “The studies, despite what Charlie says, do show that it makes a difference,” she said. The research is mixed. Some studies show no significant long-term benefit, while others suggest that high-quality preschool may have a lasting effect. The back-and-forth came as polls show a tight race. A Suffolk University/Boston Herald poll released Monday morning showed Coakley leading Baker by one point. A WBZ survey released later in the day put Baker up by one point. Monday’s debate, which was held at CityStage in Springfield and televised locally, also included three independent candidates for governor. One of those candidates, Evan Falchuk, pitched himself as a truth teller, willing to speak bluntly about everything from state finances to casino politics. Falchuk said he would vote against a ballot measure that would repeal the state’s casino law. The issue has already been debated and settled in the Legislature, he said, with casino proponents prevailing. Jeff McCormick, a venture capitalist, said he would vote to repeal the casino law and focus on what he considers more sustainable economic development. Scott Lively, a pastor, said he opposes the casino industry on moral grounds. Sponsors of the debate included The Springfield Public Forum, The Republican newspaper, Western New England University, WGBY-TV, MassLive.com, CBS 3 Springfield, New England Public Radio, WWLP 22 News, WGGB ABC 40/FOX 6, The Berkshire Eagle, and the Valley Press Club. David Scharfenberg can be reached at david.